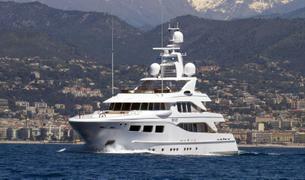 The 39 metre motor yacht Revelry has been listed for sale by Wes Sanford at Northrop & Johnson. Revelry was built in steel and aluminum by Dutch yard Hakvoort to a design by Cor D Rover and delivered in 2011 with interior designed by Michela Reverberi. She accommodates 10 guests in a main deck full-beam master suite, two doubles and two twins and all cabins on this yacht for sale have en suite bathrooms. Guest areas include an open-plan main saloon/dining area, a bridge deck saloon that opens to a sociable aft deck with seating and a teak table for al fresco dining. There is also a sun deck complete with spa pool, bar, barbecue, sofas and sun pads. The foredeck also has sunbeds as well as a small seating area. Lloyds classed and MCA compliant, she offers cruising versatility with the ability to easily make a transatlantic crossing as well as cruise The Bahamas. Revelry has a range of 5,500 nautical miles at nine knots and is powered by twin 600hp Caterpillar diesels to a maximum speed of 13 knots. For added safety and comfort in sea and in port, she is fitted with Naiad zero speed stabilisers.